In 1971 I had the opportunity to take the occasional ride on Pearce's buses. My friend Bo and I determined to spend a full day getting to know the routes better. So one summer Saturday in 1972, having driven over from home in Poole, we parked the car in Dorchester and stand waiting at the Top o'Town stop for the 8.55 departure on Pearce's route through to Yeovil. Regular performer YET600 pulls up with driver Peter, and we board and pay our fares. There are three other passengers, one is going to Maiden Newton and the other two are visiting friends in Rampisham. So far we are the only people going right through to Yeovil, until two more passengers get on in Maiden Newton. No fares are taken from the newcomers, they are told to pay on the other bus. What other bus - isn't this bus going through to Yeovil after all? Well no it isn't - we have to change buses at Cattistock garage, where Harold and YDL752 are waiting to take us further north. Six passengers and a conductress board the bus in Evershot, and a further nine people are waiting for us in Melbury. By the time we run into Yeovil past the Quicksilver Mail Hotel for our 10.24 arrival we have become a party of twenty three (including Bo and me). Our journey back to Dorchester from Frampton is in Bere Regis & District's Bedford SB VOR160. Our lady driver is surprised at acquiring passengers from Frampton on this journey. The Bere Regis route to Dorchester is somewhat more circuitous than the route taken by Pearce's buses and involves a double run off the main road into Bradford Peverell and up to Giles Close, where we gain three passengers. Five more join us as we come back down through Bradford again. Having rejoined the main A37 we then take a narrow lane through Sodern which takes us to the northern end of the substantial village of Charminster. We run south through the village on the A352, double run to Hill View (no trade), and then pick up twelve more passengers after having climbed East Hill to the Vicarage Lane housing estate. So our tally on arrival back in Dorchester is twenty two people. 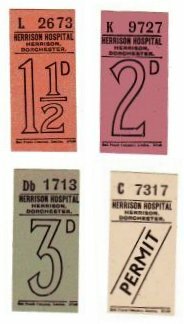 A quick change of bus and we are riding out from Dorchester towards Charminster again on the Herrison Hospital bus at 2.00. An unusual but frequent daily service, unusual in that it is not operated under a road service licence and neither are the buses PSV-licenced. Instead the buses are displaying official discs indicating that they are exempt from road tax. Strictly speaking the service is for patients, staff and visitors to the hospital, but there is a lively local trade between Dorchester and the housing estates at Charminster. We have time to watch a cricket match in progress in the grounds of the hospital before returning on the 3.15 trip - this is also the time at which the early and late shift drivers change over. 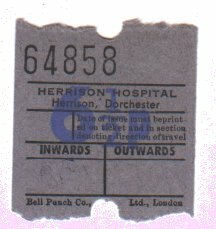 Paying our 6.5 pence fare again in exchange for a blue Ultimate ticket, we are soon back in Dorchester. After a cup of tea, Bo decides to go on and visit friends in Weymouth, leaving me to do the last part of the journey by myself. She doesn't really relish the three mile walk which is necessary to complete the proposed itinerary. I leave Dorchester on the Bere Regis service to Frampton at 4.00, still with lady driver and VOR160. I am the only passenger left on board after Charminster. This time I alight at the Royal Yeoman at Grimstone and have only five minutes to wait before 5749UP appears working Pearce's 4.20 Dorchester - Sydling - Cattistock service. The elderly driver is surprised to find a passenger waiting at Grimstone and is even more surprised when I ask to be dropped off at Staggs Folly where the bus will cross the main A37 road. Nobody has ever asked to get off there before, much scratching of head and poring over fare chart before settling on a request for 10 pence as my fare. There is a good load of some thirty people on board this service, the only afternoon run back to Sydling. Strangely only five people alight in Sydling, the remainder staying on board to continue to Cattistock. Obviously they find 4.20 a more amenable time to leave town than waiting for the 4.55 bus direct to Maiden Newton and Cattistock! I am dropped at the crossroads high up at Staggs Folly and the bus disappears down the hill. Now a brisk three mile walk northwards along the A37 lies in front of me, but it is a pleasant sunny summer afternoon, and walking along the crest of the hill there are views across the valley to the forest of radio transmission towers up at Rampisham. I have forty five minutes to my next connection. After a mile or so the Clay Pigeon cafe comes into view on my right, a remote place on a high and exposed stretch of the road, 780 feet above sea level at this point. 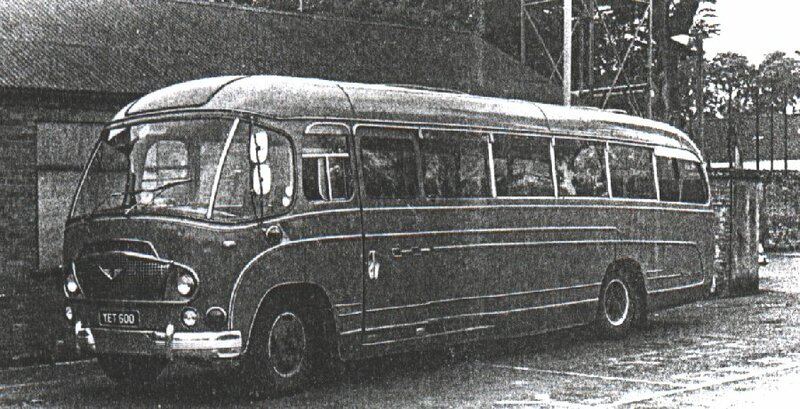 It was here in the fierce blizzards of December 1962 that sixty nine passengers from two coaches (one Royal Blue from Exeter and one Associated Motorways from Cheltenham) were stranded in the snow for several days. The snow was up to armpit depth. They had to be rescued by helicopter from the cafe where they had taken shelter as conditions deteriorated with food exhausted and toilet and washing facilities frozen up. Others were taken away in tracked vehicles down the hillside into Cattistock village, from where two coaches ferried them into Dorchester. Remembering the conditions that those poor people had suffered ten years previously, I am very glad that it is warm and sunny. A long downhill stretch of road brings me to Holywell where I have ten minutes in hand before Pearce's bus working the 5.00 Yeovil - Dorchester service arrives. It's our old friend YET600 again so it must have actually worked through to Yeovil at lunchtime. Six people alight and the driver John is surprised to pick me up on this journey. The lady conductress alights at Evershot, one more passenger leaves at Wraxall, three at Sandhills and the bus is empty except for the driver and me. We chat about the bus business, John has a long working day today, he started at 8 o'clock and won't finish until after half past ten. There is no trade for us in Cattistock, John remarks that three or four regulars are missing, ladies who usually go into town for Saturday night bingo. Three people are waiting in Maiden Newton and three in Stratton, and that is all for this trip. We arrive in Dorchester at 6.35, and John has now to run back dead to Cattistock garage. But one lady is waiting to ride out with him on this officially out-of-service journey. No problem at all, this is country bus operation at its best. I bid John goodnight and go to rejoin Bo. 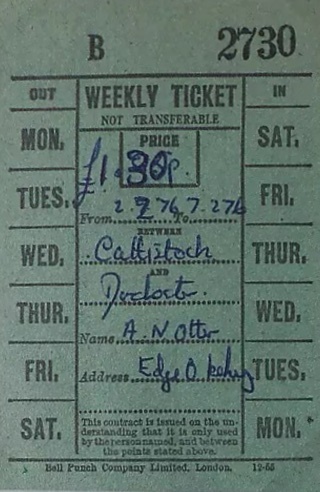 My day is over and I have learned a lot about the company, its operations and its routes - but John has one more round trip to do, 8.50 in from Cattistock and 9.40 back out to Evershot from Dorchester. As I drive home from Weymouth later that evening with Bo I notice the 9.40 bus go out with sixteen people on board - and with that number of passengers I guess John will have to run the full route out to Evershot with little chance of nipping in and parking up at early as he goes by the garage . . . . .